March went by so quickly. And then I blinked and we were 3/4 of the way through April. How did that happen? I've written to you all dozens of times in my mind. Somehow making the time to get here and post just doesn't happen even when I have stuff to say. I can't make any promises that I'm really back... but I'm trying. March was a banner month at the Andrews household. Really and truly. Rachel found a new job at a really good starting salary for a recent college grad working for Entercomm in Bala Cynwyd. An honest-to-goodness full time job with a salary and benefits! She started March 6th. After her first day driving into the city and back, she came home and announced that she was OVER the commute. Three weeks later, on April 1st, we moved her into an apartment in Manyunk. An eight minute commute to work. She has her own bedroom with a private bath, but shares the common space with three other young women. It's a nice place - not great parking, but she's happy to be in the city and that's what matters. She is now really on her own for the first time and it is scary and exciting and frustrating and fun all at once. And her support network is a mere hour down the highway. 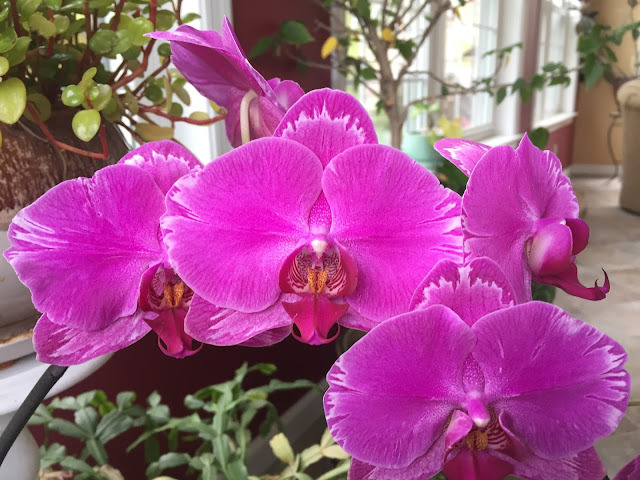 My orchid plant blossomed - which seems to happen every other year. But the flowers are gorgeous this time! On March 17, after FOUR. LONG. YEARS. of searching (while employed at a soul-sucking slave labor IT job for a company that makes a practice of purposefully demoralizing their employees), Jay was offered a new job which he started on April 10th. It is similar work and similar pay as what he was doing, but so far the new job is super laid back and his boss seems pretty nice. So yay! Then, on March 23rd Becca FINALLY got her letter from Lehigh Carbon Community College and she was ACCEPTED (YAY!!!) into their highly competitive Physical Therapy Assistant program. They get like 200 applicants a year and only accept 35. She will start in August. And we are breathing a collective sigh of relief ... because Becca has both A.D.D. and generalized anxiety disorder, the waiting for an answer so that she knows where her life is head next was stressing her out big time. The girl absolutely requires routine, consistency, and long-term planning to stay sane. But now we know and she can move forward. She is so excited and we are all pleased and so proud of her. 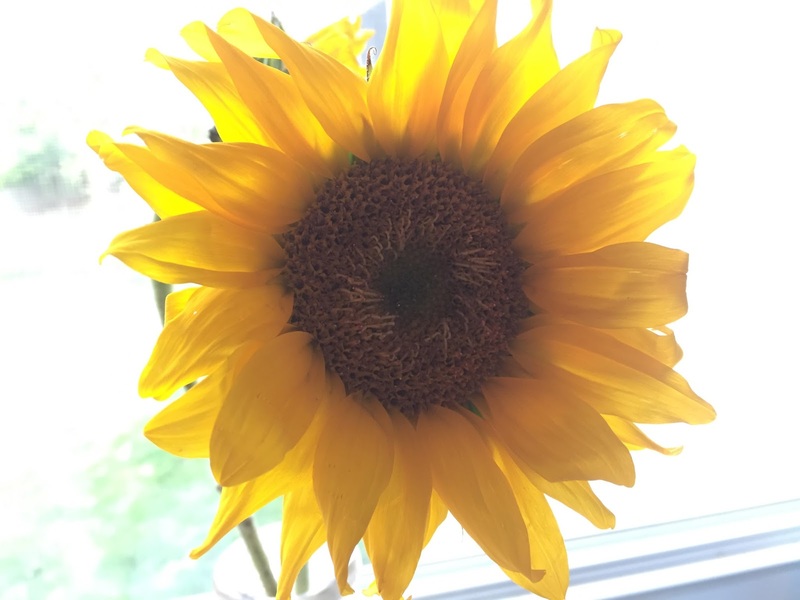 I bought myself sunflowers for Easter. 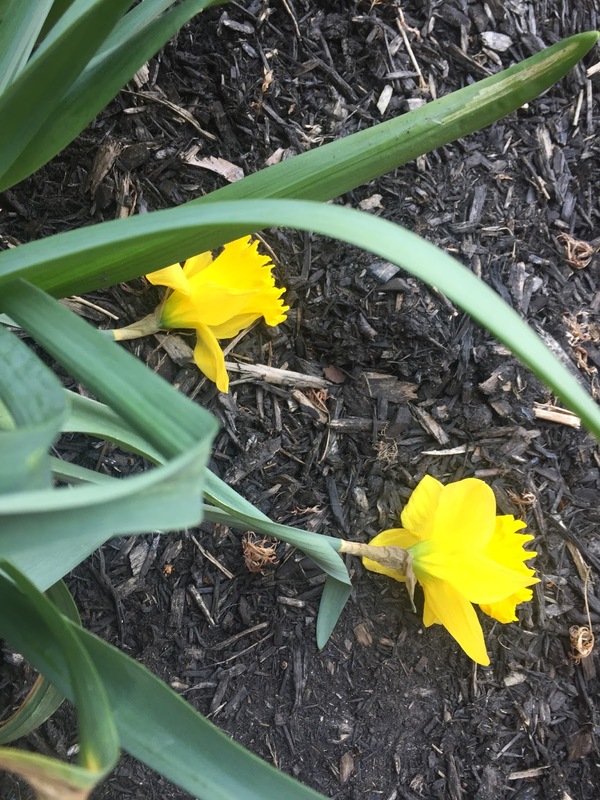 After the snow cleared, they still managed to flower, although the heads were laying on the ground. April 14th. I don't even know what these are, but they came up on their own several years ago and have multiplied each year. Now they look like an intentional planting, in big bunches in the front shrub bed. Over the last week, Spring has really taken over. All the trees are leafing out, the flowering trees are filled with blossoms, it is all so pretty and green... and yet, I've felt oddly disconnected from it all this year. I leave on Wednesday morning for a girl trip with my sister Deanna. We are headed to a tropical island. We are planning to sit in the sun, read books, walk the beach, and generally just take it easy. As a plus, there is truly limited internet access and I won't have cell phone service as I'm not activating an international plan. So I'm hoping this will be just what my soul needs. Have a great vacation! What fun to have a chance to vacation with your sister. I think those pretty purple flowers are grape hyacinths, but maybe someone else will know better. We're always glad to see you whenever you have the time to get to blogging! Wow, what a lot of great changes! Great to see you back, and I agree with Karen, the plants are grape hyacinths. 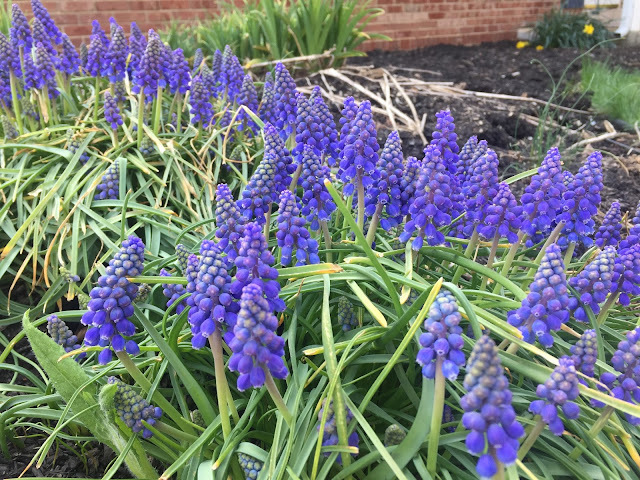 How lovely to know that despite the weather, your flowers (yes, the blue ones are grape hyacinths) continued to bloom ... And great news about Becca and Rachel! Many congratulations to them :). Hoping you have a perfectly splendid time away with your sister. I so wish I had one! There is no better feeling than having your family settled.That just about assures you will have a nice relaxing time on your trip!! I'm heading to the beach with my sisters this weekend.Our weather doesn't look good. Hope yours is better! Oh Cheri, I do hope you and Deanna are having a wonderfully relaxing time!! I'm so excited to hear about Jay's new job - yippee!! And the girl's news is all so good, too. Wow, lots has happened in your world. Well I am late to this party ... hoping that the vacation is/was good & that you feel restored. Congratulations to all in securing some better job opportunities. Being a physio therapist will be so rewarding - I work at a physio clinic & we have some really kind fabulous therapists who are very dedicated to their patients.